I've got new Acer Aspire ES 15 with InsydeH20 bios I'm going to setup dual boot with Windows 10 and Linux Mint. I successfully installed Windows but Linux setup hangs when grub starting to install. I think, it's because of UEFI boot mode enabled in bios. But boot mode selector is inactive (can't open switch menu). Now I'm disabled Secure Boot which became available only when I've setted up the supervisor password. Boot Mode is unchangable yet UPD Live USB was created via Rufus util with UEFI/GPT mode Exact point of hanging is creating config file /etc/default/grub with new version after that nothing happened. Why it doesn't successfully configured grub? Let me try to answer this with a bit more background and formatting than in comments. When a computer boots it needs to start somewhere. It needs some kind of instructions. For some CPU's that means reading the highest adress bits they can access and starting to execute a program from that adress (e.g. 6502). Some use different mothods. But all need some well defined place where they get their instructions are start executing them. These instructions are called the firmware. Your washing machine has them (at least the modern ones). For an IBM compatible PC (1980's this program provided Basic Input and output routines and was called the BIOS. It would check several things (like count memory), then look for devices marked bootable, read the bootloader from the first device and transfer execution to that. This basically has not changed since the first 4.77MHz XTs up to pentiums. Other computers (e.g. Suns, Indy/SGI, Apple, nextstep, Alpha's, ...) used their own firmware. Often much much capable then the PCs'. For some reason (backward compatability?) the default firmware for the PC stayed more or less the same across decades1. That is good for compatability, but after several decades it was severely outdated. For this reason the EFI standard was developed. It is much more capable. It is also quite different and basically incompatible with BIOS firmware. That is not sto say that it looks any different. BIOS firmware and EFI firmware can be as hard to tell appart as a petrol fueled car can be from a diesel fueled car. Yet many keep calling the UEFI firmware and EFI BIOS. Which is akin to calling a car a 'diesel car which only runs on petrol and not on diesel'. It is wrong. Simply wrong. Sadly it is not uncommon either and many big names are using it, probably because it sounds more familiar to the layman who called a firmware a BIOS, even when it is something completely different. BIOS uses interupt calls for a lot of things. BIOS always supports MBR partitioned disks. 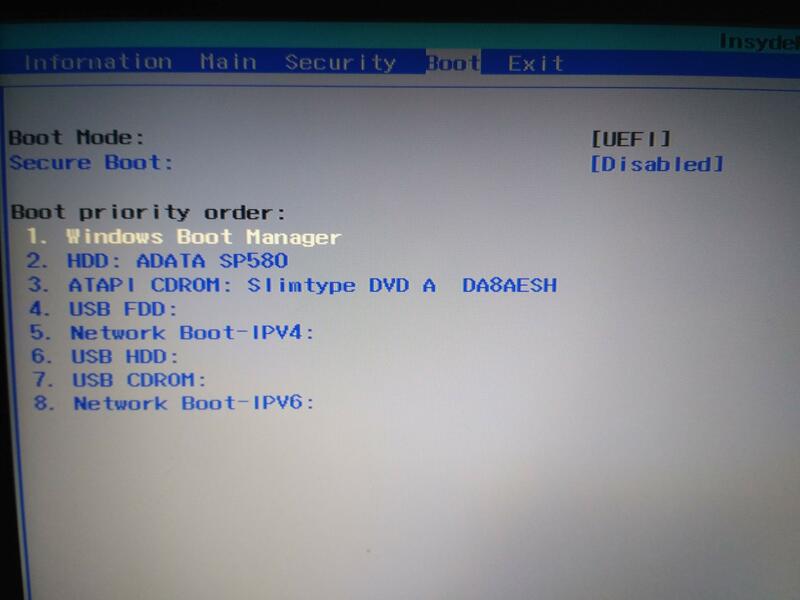 BIOS boots from a bootsector (special code in aspecial place) on an MBR formatted disk. MBR format only allows for 4 primary partitions (plenty in the time if 5MB harddisk, but lacking in modern times)2. It has many more options which are not compatible with the was the BIOS firmware did things. It always supports GPT formatted disks. GPT formatted disks can have many partitions. One of those is usually the EFI system partition (ESP). EFI firmware can look on the ESP for a file to boot from. This file can be specific in NVRAM. If it is not present it will fall back to defaults, like ESP:/EFI/Boot/BootX86.EFI. Since there was a long period where BIOS was the standard and EFI was new many EFO firmware programs incorporated something called CSM (Compatability Shims). If you enabled these they would not only accept proper EFI calls but also to to resolve old BIOS style calls. It still is a EFI though. In other words: It still is a diesel car which runs best on diesel but which will not explode if you add petrol. Add to this the habit of people mixing up the names and you can confusion gallore. OK, this BIOS is not a BIOS. It is EFI. I'm going to setup dual boot with Windows 10 and Linux Mint. How did you install windows 10. I am assuming that you installed it in EFI mode. Which means that you also want to install mint in EFI mode. Do not enable CSM or a protective MBR. This will only confuse matters. I successfully installed Windows but Linux setup hangs when grub starting to install. Grub supports both BIOS and EFI. Do you have an ESP with a grub.efi file? Sadly I will leave your answer open here since I have no idea what is going on. Secure boot is an EFI feature will will check .EFI binaries before trying to boot them. No idea what setting a password has to do with that though. 1: More or less since PnP got added since late ISA. PCI enumeration, etc etc. 2: One of the changes to modern BIOS firmware is to understand extended partitions. Still limited though. Near the top of your screen, you can see Boot Mode: [UEFI]. This is pretty clear. Among the boot options is Windows Boot Manager. A system with Windows installed in EFI mode is likely to have a boot option of this name, but you won't see it if the system is configured to boot in BIOS mode; or at most, it might be present but be disabled. You might not have booted in EFI mode -- Unfortunately, controlling the boot mode of EFI-based computers can be tricky. Most have a Compatibility Support Module (CSM), which enables them to boot older BIOS-mode boot loaders. Since Linux installation media may contain both BIOS and EFI boot loaders, if a CSM is active on your computer, it's a coin-toss as to which boot mode will be used. See this page of mine for more on this subject. To correct this problem, you may need to fine-tune your firmware settings, create a fresh boot medium using another tool or other options in whatever tool you used, or use the computer's boot manager to select the boot option for the external medium that will boot into EFI mode. All of these options are covered in more detail on my page. Program bugs -- The installer might have a bug that's preventing GRUB installation. On an OS installer, the usual solution is to upgrade to a newer version of the OS. You don't say what version of Mint you're trying to install, so I can't tell whether this is an option for you; but switching to another Linux distribution is certainly a possibility. EFI bugs -- If the EFI is doing things that are causing the GRUB installation to fail, you might see an error like you're reporting. A workaround in a newer version of Mint, or switching to another distribution, might enable the install to complete. Upgrading the firmware would be a better option, but most manufacturers aren't very responsive to such bug reports, so that's a bit of a long shot. Boot Repair -- The Boot Repair tool can install GRUB 2 from an emergency boot disk. The trouble is that, if you booted in BIOS mode to install Mint, Boot Repair is likely to do the same, and it must be booted in EFI mode to properly install an EFI-mode boot loader. If Boot Repair complains about the absence of a BIOS Boot Partition, then it's booted in BIOS mode and you're back to Square One. rEFInd -- My rEFInd boot manager is an EFI-only boot manager. The USB flash drive or CD-R versions, when written to appropriate media, will boot only in EFI mode, and should enable you to boot to Mint. Once you're in Mint, you can install the GRUB 2 package (grub-efi, IIRC) or install rEFInd's Debian package or PPA (as described in the rEFInd documentation). There are other EFI boot loaders you could install, too, but GRUB 2 and rEFInd are the easiest to install and maintain, at least in Mint. Not the answer you're looking for? Browse other questions tagged bios multi-boot grub uefi grub2 or ask your own question. How to boot in UEFI mode (Intel DP43TF)? Linux Mint 18, Windows 10, UEFI, dual boot, where to install GRUB? Why does an OS and its installer behave differently depending on whether legacy mode is used or not?